The Sachem is one of the southern-based migratory skippers which, like the Fiery, Ocola, and Long-tailed Skippers, usually arrive in our state toward the end of the summer season. Sachem was first found in Massachusetts only recently, in 1995. It was a rare sight for seventeen years after that, but in 2012 and 2013 there was a great explosion in numbers. In 2012 fresh individuals were found in May in Westerly, Rhode Island, and observers speculated that Sachems may have over-wintered there and on Martha's Vineyard in the warm winter of 2011-12. If so, that would be the first known winter survival in New England; usually the Sachem dies back here each winter, lacking cold tolerance. French lepidopterist J. B. A. Boisduval first described and named this skipper, but he was working from a California specimen. Samuel Scudder in Massachusetts and W. H. Edwards in West Virginia did not at first think that their specimens were identical to Boisduval’s, and so called this skipper Atalopedes huron, naming it for the Huron Indians in Southern Ontario and Quebec. They thus followed the tradition, begun by Thaddeus W. Harris, of naming skippers for Native Americans. Ultimately, Boisduval's scientific name prevailed, but this skipper’s common name, Sachem, the Algonquin word for Chief, remains as an attempt to assert the species' New World origins. The Sachem was not known in New England in Scudder’s time. The Catskill Mountains in New York were “the nearest point to New England at which it has been taken,” and even that was “many years ago” (Scudder 1889: 1666). Farquhar (1934), who reviewed the region’s lepidoptera in the 1930’s, does not list Sachem. There are apparently no records of Sachem in Massachusetts until 1995. And there is only one record in Connecticut prior to the 1990’s, one captured 14 October 1985 at Branford (Yale Peabody Museum). Evidence suggests that Sachem has been slowly pushing its flight and over-wintering ranges northward (Crozier 2002). It is a permanent resident from Virginia south, and probably in southern New Jersey as well. In the 1990's it was still an "uncommon visitor" in Connecticut and in New York (O'Donnell et al. 2007; Gochfeld and Burger 1997; Pavulaan 1999). Since then, sightings have increased in those states. Bermuda grass (Cynodon dactylon), crabgrass (Digitaria), St. Augustine grass (Stenotaphrum), and goosegrass (Eleusine) (Scott 1986; Opler and Krizek 1984) are the known natural hosts. Crabgrass is particularly abundant in Massachusetts. Cech (2005) terms the Sachem “a prolific butterfly of disturbed open spaces,” which can be found in “almost any imaginable” open, grassy sunny area, including gardens, lawns and parks. For example, B. Benner once recorded 100+ in a small Staten Island public garden in September 2002 (Benner 2010). Sachem uses a great variety of nectar sources. It has three or more broods, flying all year in Florida. The Sachem arrived in Massachusetts in 1995, no doubt owing to a multi-year population explosion that took place in southern states. There are four records from that year: 7/1/1995 West Tisbury, P. Mililotis (specimen taken); 7/4/1995 Chilmark, A. Keith; 8/8/1995 Hingham World’s End Reservation, B. Cassie; and 9/27-28/1995 Sudbury, T. Dodd. 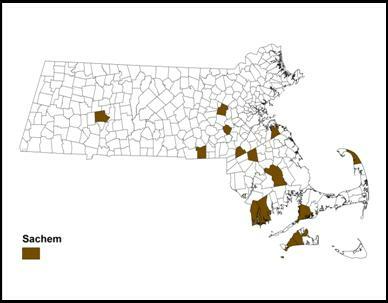 These are the first records for Massachusetts; Sachem was not found during the 1986-90 MAS Atlas years or earlier. However, from 1995 on, at least one Sachem was reported almost every year in Massachusetts. Sachem was reported in 15 of the 23 years 1991 through 2013 (Charts 98a, 98b). The totals seen in any year 1995-2011 were less than five, except for the 25 seen in 2008 and 15 in 2011. 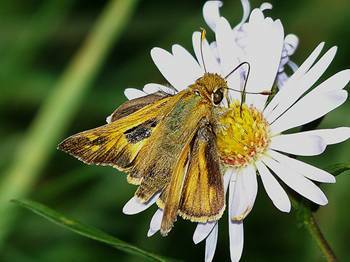 Through 2011, Sachem had not been seen quite as frequently or in as many numbers as Fiery Skipper, but sightings were increasing. MBC sightings totals 2000-2007 had ranked the Sachem as “Rare” (Table 5), but even by 2011 it was obviously no longer in that category. Then in 2012 and 2013 there was an explosion of Sachem numbers; approximately 130 were reported in 2012 and approximately 450 in 2013 (Chart 98a). In 2013 the earliest report was 6/4/2013 from Wellfleet Bay WS on Cape Cod; the early June date again suggested that Sachems had successfully over-wintered nearby, as they probably had in 2011-12. Sachem is another case, like the Fiery, Ocola, and Long-tailed Skippers, in which there are essentially no historical records, but a burst of sightings beginning in the 1990’s. None of these species had been found during the 1986-90 Atlas years. But from 1992 on, Sachem was seen in 15 of the 19 years 1992-2010, Fiery Skipper was seen in 17 of the 19 years, Ocola Skipper was seen in 10 of the 19 years, and Long-tailed Skipper seen in 12 of the 19 years. List-length analysis of MBC 1992-2010 data (Breed et al. 2012) found a 691% increase in Sachem, a 260% increase in Fiery Skipper, and a 250% increase in Ocola Skipper, although no significant increase in Long-tailed Skipper. Of all these increasing southern immigrant skippers, Sachem is probably the one most likely to survive a warm winter here. Sachem sightings are probably slowly increasing in frequency in states to our south. In Connecticut, where the first record was 14 Oct 1985 (Branford), there are two 1999 records from the Connecticut Atlas period and many more recent sightings. In summer and autumn 2002 moderate numbers of Sachems were observed in that state, and several were again reported in fall 2005. (O’Donnell, Gall and Wagner 2007: 286). There are also 16 recent sightings in Rhode Island, for example, 25+ at Westerly, 9-4-2010, M. Arey. All Sachem sightings have been in eastern Massachusetts except for several reports from Northampton (Maps 98a and b). Between 2010 and 2013, Sachem dramatically expanded its reported range in the state, as can be seen by comparing Maps 98a and 98b. In this period it arrived on the North Shore and by 2013 had been reported from Rockport, Ipswich, Rowley, Newbury, and Newburyport. It also was first reported from Nantucket, although it could easily have been there earlier since there are so few observers reporting from that island. Sachem also increased dramatically on Cape Cod and the south coast, and by 2013 was reported from nearly all towns on the Cape. Sachem had been reported from 16 towns through 2010; through 2013 it had been reported from 46 towns, adding 30 towns in the years 2011-2013. On Cape Cod, many were seen in 2012 but 2013 numbers exceeded all expectations. In Eastham Fort Hill area 88 were counted on 9/6/2013, M. Faherty, with another 10 found in ten minutes at St. Aubins nursery nearby. On Morris Island at Chatham Monomoy NWR, 15 were counted on 9/18/2013, M. Faherty. Sachem was reported as "ubiquitous" on the Cape, even found at "the malls in Hyannis." There were also two reports from Cuttyhunk Island that year. On Martha's Vineyard, 10 were reported on the NABA Count 7/20/2013, 7 in Edgartown and 3 in Oak Bluffs, all in disturbed areas. On Nantucket, 12 were reported on 10/18-20/2013, M. Faherty, at various places around the island. On the south coast, 40 were reported from Mattapoisett Nasketucket Res. on 9/7/2013, M. Arey, part of an "explosion in this area." There were also reports that year from Fairhaven, Marion and New Bedford. The largest numbers were counted at Westport-south Dartmouth Allens Pond Wildlife Sanctuary and Sylvan Nursery: S. Moore and L. Miller-Donnelly reported 128 at Sylvan Nursery on 9/7/2013 and at least 80 on the sanctuary, for a total of well over 200. Other significant locations were Westborough Heirloom Harvest CSA, 1 on 9/20/2012, S. Arena http://www.flickr.com/photos/pokedaddy/8021055356/in/photostream ; Somerset, 2 on 10/8/2013, D. Gagnon (ph); Concord Nine Acre Corner, 2 on 9/12/2012, G. Dysart ; Northampton community gardens, 1 on 8/28/2012, T Gagnon, R. and S. Cloutier (also 1 on 8/19/2005, T. Gagnon; these are the only reports so far from the Connecticut River valley); Newburyport turnpike, 1 on 8/18/2012, M. Arey; Rockport Halibut Point SP, 3 on 9/3/2012, M. Arey; Ipswich Appleton Farms, 1 on 9/20/2013, M. Arey. Prior to 2013, Sachems were not seen in Massachusetts until July (http://www.naba.org/chapters/nabambc/flight-dates-chart.asp). But in 2013 the first sighting was June 4 on Cape Cod (Wellfleet Bay WS, M. Faherty, photo); this was the first report of a spring flight in the state, and signaled probable over-wintering nearby. In 2014 came further evidence of over-wintering and a spring flight, this time on Martha's Vineyard. A fresh female Sachem appeared in Oak Bluffs on 5/31/2014 in M. Pelikan's yard (photo), and another was seen on 6/1/2014. Sachem is multi-brooded in southern states. A spring brood beginning in June was first observed in Massachusetts in 2013. In prior years, when they were observed here only in July, they still had time for at least one more brood. For example, in an Oak Bluffs yard in 2011, a female was first seen on July 20, then four individuals in September/October at the same spot, making it likely that a brood was produced there that year (Pelikan, 7/14/2012 masslep). Courting behavior among Sachems has been photographed (e.g. F. Model at Dartmouth on October 8, 2004), and mating observed, but egg-laying and larvae have not yet been observed or photographed, although they are undoubtedly present. Earliest sightings: In the 23 years of BOM-MBC records 1991-2013, the five earliest "first sightings" are 6/4/2013, Wellfleet, M. Faherty (ph); 7/1/1995 West Tisbury, P. Mililotis (sp. taken); 7/5/2001 Sherborn Western Ave. CA, R. Hildreth; 7/14/2012 Oak Bluffs, M. Pelikan; and 7/20/2011 Oak Bluffs, M. Pelikan. Latest sightings: In the same 23 years of BOM-MBC records, the five latest "last sightings" are 11/2/2013 Somerset, D. Gagnon (ph. ); 10/20/2008 Dartmouth Allens Pond M. Champagne; 10/18/2012 Dartmouth Allens Pond, F. Model; 10/11/2010 Dartmouth Allens Pond, B. Bowker; 10/11/2009 Dartmouth Allens Pond, E. Nielsen. Somerset and Dartmouth are both in coastal southeastern Massachusetts. Before 2005, the last sightings were all in September, but in recent years they have usually been in October. In the seven years 2007-2013, Sachem has been seen flying until into October, and in one year into November, largely at southern locations. 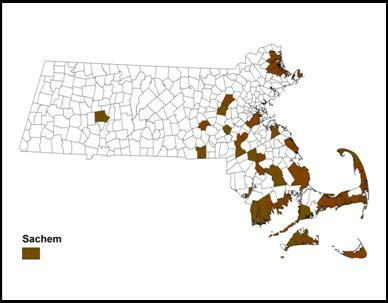 Sachem has dramatically increased in Massachusetts in the last twenty years. It was not here at the time of Scudder a century ago. Sightings will probably increase in Massachusetts as climate warms (Table 6). In years of warm winters, some may survive the winter here. Given Sachem’s multiple broods, use of common lawn grasses as larval hosts, and liking for disturbed areas, populations to our south may also increase, so that even when colder winters prohibit survival here, more dispersing individuals will still arrive in mid-summer. And the earlier they arrive, the more brood cycles are possible. Butterfly gardens are a favorite habitat for this skipper; in gardens in Virginia Sachems are well-known for their wild chases, playful antics, and general “clownish” behavior (Pavulaan 1999).